Get the facts about your workers’ comp case before you hire an Iowa law firm. Walker, Billingsley and Bair a law firm in Des Moines, Iowa providing information at no cost or risk about work injuries and the Iowa workers’ compensation system so you can make the best decisions in your case. Attorneys Corey Walker and Erik Bair worked their way through law school in construction and labor jobs – they know the dangerous work many Iowans perform on a daily basis. Any type of work can result in a workplace injury, and the Walker, Billingsley & Bair Iowa law firm is dedicated to handling all manner of serious work comp injury claims. 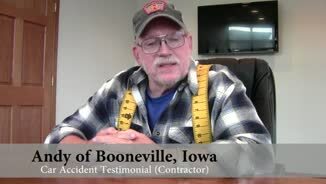 Too many workers’ compensation cases are damaged and thousands of dollars are lost because injured Iowa workers are unaware of their rights and responsibilities. As you gather information about your rights as an injured worker and research law firms in Des Moines, Iowa, request a copy of our free book about the Iowa workers' compensation system, and then make the informed decision that is right for you. The work injury attorneys at Walker, Billingsley and Bair have fully staffed offices in Des Moines, Newton, Ankeny, and Marshalltown along with by appointment only locations throughout the state of Iowa including Cedars Rapids, Waterloo, Davenport, Dubuque, Decorah, Council Bluffs, Algona, and Sioux City. Homebound appointments are also available. Call us today at 641-792-3595 to schedule a FREE consultation. When you or a loved one have suffered serious injury from a car or truck accident, don’t pick the first Iowa law firm you see advertised on a billboard. Too many good auto accident cases are damaged because injured Iowans don’t take the time to research law firms in Des Moines, Iowa. If you are unaware of your rights and responsibilities for filing a car accident injury claim, the Walker, Billingsley & Bair Iowa law firm is here to inform. 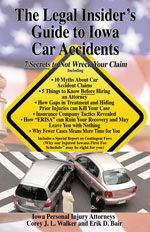 Request your copy of our free book about Iowa car and truck accident cases, and then make the informed decision that is right for you. We know there are many law firms in Des Moines, Iowa that handle traffic accidents, which is why we want you to be able to get as much information as you can before you schedule a consultation with any Iowa law firm. The personal injury attorneys at Walker, Billingsley and Bair are available to traffic accident victims at fully staffed offices in Des Moines, Newton, Ankeny, and Marshalltown along with by appointment only locations throughout the state of Iowa including Cedars Rapids, Waterloo, Davenport, Dubuque, Decorah, Council Bluffs, Algona, and Sioux City. Homebound appointments are also available. Call us today at 641-792-3595 to schedule a FREE consultation. The Iowa Department of Transportation reported 54 motorcycle crashes in Iowa in 2012 and 56 fatalities. Negligent, reckless drivers can pose a serious threat to Iowa bikers, and our Iowa law firm is here to help. Motorcyclists often get a bad reputation for being reckless, speeding drivers, but we know that even the safest riders can be involved in a serious accident when other cars on the road are negligent. The attorneys at Walker, Billingsley and Bair provide free information about Iowa motorcycle accident cases because too many good injury cases are hurt when Iowans make common but damaging mistakes. 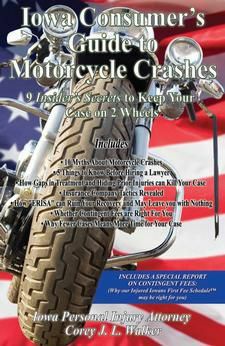 Our free book about motorcycle wrecks in Iowa contains important information about the Iowa motorcycle and personal injury laws, as well as your rights to compensation for injuries that result from another’s negligence. The personal injury lawyers at Walker, Billingsley and Bair are available at fully staffed offices in Des Moines, Newton, Ankeny, and Marshalltown along with by appointment only locations throughout the state of Iowa including Cedars Rapids, Waterloo, Davenport, Dubuque, Decorah, Council Bluffs, Algona, and Sioux City. Homebound appointments are also available. Call us today at 641-792-3595 to schedule a FREE consultation. When you or a loved one have suffered serious personal injury, don’t pick just any Iowa law firm. Too many personal injury cases are damaged because injured Iowans don’t take the time to research the law firm they are going to hire. If you are unaware of your rights and responsibilities in an Iowa personal injury case, the attorneys at Walker, Billingsley & Bair are here to help you find out. 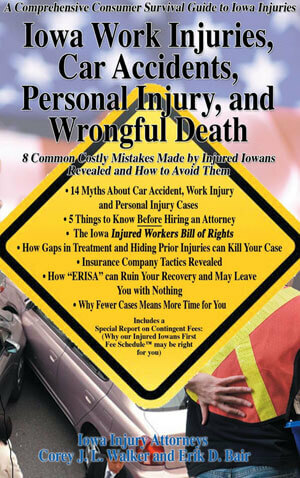 Request your copy of our free book about Iowa personal injury cases, and then make the informed decision that is right for you. We know there are many law firms in Iowa that handle personal injury cases, which is why we want you to be able to get as much information as you can before you schedule a consultation with any Iowa personal injury attorney. The personal injury attorneys at Walker, Billingsley and Bair are available to injury victims at fully staffed offices in Des Moines, Newton, Ankeny, and Marshalltown along with by appointment only locations throughout the state of Iowa including Cedars Rapids, Waterloo, Davenport, Dubuque, Decorah, Council Bluffs, Algona, and Sioux City. Homebound appointments are also available. Call us today at 641-792-3595 to schedule a FREE consultation. Even a dog with no history of aggressive behavior can attack under certain circumstances. It’s not just the typical “aggressive” breeds that are responsible for dog bites and attacks. Our firm has seen a variety of dogs involved in animal attack cases. The Walker, Billingsley and Bair Iowa law firm wants to ensure every Iowa resident knows his or her rights to file a claim against a dog owner whose animal causes serious injury. 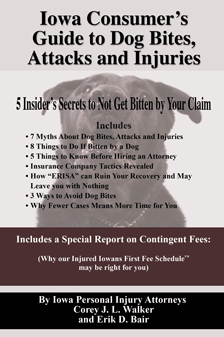 Our attorneys have written a free book on dog attacks in Iowa with information on the Iowa dog laws, personal injury claims, and what you need to know to seek compensation for your damages. Too many dog bite cases are damaged because injured Iowans are unaware of their rights and the responsibility an Iowa dog owner has to keep the animal secured. After reading our free book you should have the information you need when reviewing law firms in Des Moines, Iowa that handle dog attack cases. When you are ready to make an informed decision that is right for you, the personal injury attorneys at Walker, Billingsley and Bair are available at fully staffed offices in Des Moines, Newton, Ankeny, and Marshalltown along with by appointment only locations throughout the state of Iowa including Cedars Rapids, Waterloo, Davenport, Dubuque, Decorah, Council Bluffs, Algona, and Sioux City. Homebound appointments are also available. Call us today at 641-792-3595 to schedule a FREE consultation. 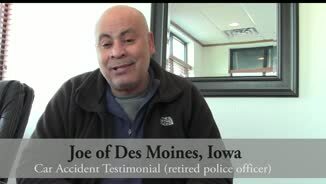 Since 1975, we have helped hundreds of injured Iowans make financial recoveries from injuries. Unfortunately, in the last 40 years we have seen far too many hardworking Iowans make costly mistakes before they hired us because clients they did not know about their rights and responsibilities under Iowa law. While you may not need an attorney in your case, you should at least learn about your rights and responsibilities so you can avoid making a costly mistake. Should I provide a recorded statement to the insurance company and sign papers for them? How do I know if the insurance company's settlement offer is fair? Who should pay for my medical bills? If I hire an attorney how do I pay them? What is the Iowa Second Injury Fund, and does it apply to my work injury? Before you sign any documents for the insurance company, hire a personal injury attorney or make a potential mistake in your case, learn about your rights and responsibilities by downloading one of our FREE Books! In order to protect yourself and your case, it's imperative you understand your rights and responsibilities under Iowa's laws. Insurance companies have legal teams working for them. What book or resource do you have to protect your rights? Who is looking out for your best interests? Sometimes insurance companies will take advantage of injured Iowans who do not know their rights by offering them low settlements or denying payment altogether. Before you talk to the insurance adjustor, sign any forms, or hire a lawyer, educate yourself! Knowledge is Power - Our injury attorneys are dedicated to Leveling the Playing Field Between Injured Iowans and Insurance Companies™. 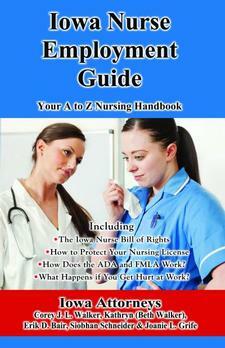 The attorneys at our firm have written injury books and articles and provided legal education for other attorneys. Our knowledge and experience puts the power in your hands so you can make the right decisions. Communication – Our firm takes pride in having a close relationship with our clients, and communication is a key part of this. You can rest assured that our firm will explain the legal process to you, answer all of your questions, keep you informed about your case including sending you copies of letters, and usually returning your phone calls and emails within 24 hours, unless our time is being devoted to a trial. What We Do For You - Sometimes the best advice you can get from an injury attorney when you're thinking about bringing a case, is that you don't have a claim that can be won. If that is true, we will tell you so. We'll also tell you when we think you're better off handling the claim yourself. But, if your case passes our test and we accept it, you have Our Guarantee that we will follow the Golden Rule and treat you like we want to be treated. This means that you will have our personal attention and we will devote our time, money and effort to get you the best results possible in your case. We will also keep you up to date on what is happening with your case and give you our advice as to whether you should settle your case or go to trial. What do our past clients have to say about us? For immediate assistance and our no cost injury evaluation, call us now at 641-792-3595 or fill out our confidential contact form to get the information you need. No matter where you live in Iowa, we can help. We have fully staffed offices in Des Moines, Newton, Ankeny, and Marshalltown along with by appointment only locations throughout the state of Iowa including Cedars Rapids, Waterloo, Davenport, Dubuque, Decorah, Council Bluffs, Algona, and Sioux City. Homebound appointments are also available. Call us today at 641-792-3595 to schedule a FREE consultation. We are here to help you through what may be one of the most difficult times in your life. View past cases here. 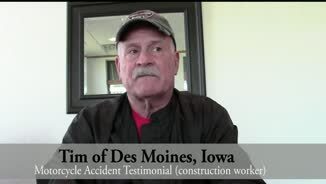 These are results from Iowa injury cases that we have successfully resolved. Keep in mind that each case is different. Contact us today to discuss your Iowa injury case free of charge. You can also use our contact form to have your case reviewed by one of our lawyers. Learn 8 Common Mistakes and How to Avoid them in an Iowa personal injury case. Don't miss out on the recovery you deserve. CALL NOW 641-792-3595 to learn more.